Alexandra gave me Mogli's lead rope and I started my first horse clicker training session. It quickly turned out to be more challenging than expected. During the previous discussion with Alexandra, all the individual steps, and their sequence, which I had to observe, were perfectly clear to me. I should get "Grown ups" several times one after the other, click, reinforce and then go a step "Walk off causally", while giving the signal for "Grown ups" and form a training loop to adjust Mogli and me. The practice looked as follows: I waited with the click for "Grown ups" for too long, Mogli began to push at me with the nose, after I took the first step, I could not go back to standing immediately afterwards because I was still thinking about the correct order of the movements, which were part of the signal for "Grown ups". The training was bumpy, felt very strenuous for me and by no means the way I wanted to train. Only a few repetitions worked smoothly, with soft, flowing movements, giving me a sense of how our common training should feel. After a few minutes we finished the training session, Alexandra and I had seen Moglis and my level of training. The next step was to plan the next training session. The second day started with awareness and balance exercises for us humans. Over the years, Alexandra has developed her very personal combination of different exercises for body awareness and I am always surprised at the great influence these exercises have on my body awareness and balance. After lunch we began to work with the horses in turn. On the basis of the first training session, each team had selected tasks that they wanted to implement. I used the time as a spectator and tried to figure out why the exercises that Alexandra performed with the horses were so light and harmonious. As a child, I have solved riddles with enthusiasm on rainy days. Perhaps one or the other still knows them. 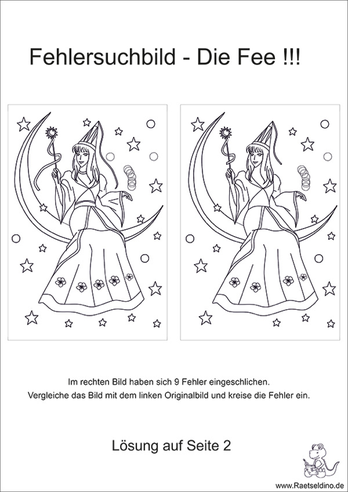 On one side the original picture is pictured and right next to it is the picture with little things that have been changed. The goal was to find the specified number of "errors" in the shortest possible time. Without consciously thinking about it, I used this playfully acquired ability and watched Alexandra. How did she move? In which direction, at what speed? Where did her movement begin? Where did it end? How did the horse respond? How did Alexandra's movement change in the next round? Where did she position herself after feeding? I noticed that all her movements began with a minimal change of her balance in the feet, these small changes continued through her whole body to her hands, and then this change became visible in the movement of the horse. Watching the training with the horses became an exciting game for me. 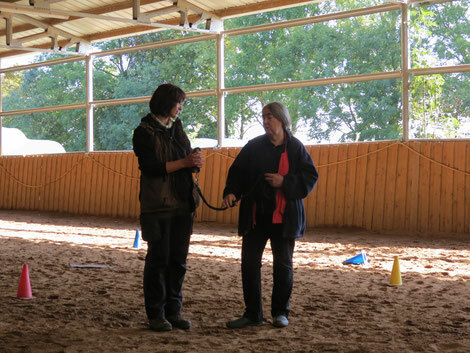 The challenge was: could I predict how the horse would behave as a result of the balance changes, the resulting positioning of the horse and the signals given through the lead rope? Where were the subtle differences when a training session was successful and when did the horse not react with the expected movement e.g. the straight backward step or lateral step? At the end of the afternoon I had seen a lot of small details that had a great influence on the movement of the horse, and I had learned that it was not enough to copy Alexandra's hand movements with the lead rope to train successfully. Eventually, all horses had completed their training session and Alexandra wanted to hear my training plan. After the familiarization with Mogli the day before, I had realized that I had to reformulate my goals. Mogli has had very little experience as a clicker horse, his repertoire amounted to about 5-6 basic exercises. Within the remaining 3 units, the time would be too short to teach him a wide repertoire of exercises that Alexandra would need as a basis for creative playing. The understanding that the smallest details matter in a successful communication, took me to the decision that I was not ready to take another training unit with Mogli. I did not yet have the ease of movement to give my signals gently and unambiguously. How could I expect him to be soft to me? As long as I needed so much of my attention to the coordination of my body language, my signals would feel bumpy and rude to him. To the astonishment of some participants, I asked Alexandra for another unit of rope handling without a horse. 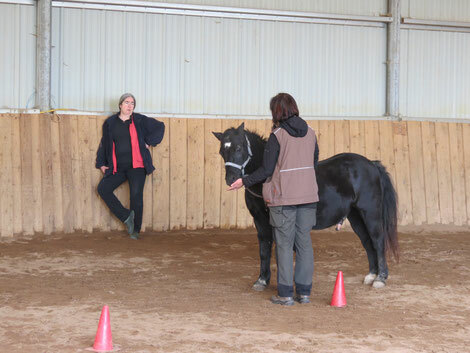 My goal was to train my coordination until I was able to give the signals gently and kindly over my lead rope, and secondly, to be able to move correctly and fluently without thinking about every single movement. This is the only way to read Mogli's reaction to my behavior and to adjust my behavior according to his reaction and finally to achieve a soft and friendly communication. At the end of the training session I had made a first breakthrough and looked forward to the next day. I just needed to recall the newly learned body feeling and would be able to communicate with Mogli in a gentle and friendly way. We started the new day with Micro-riding. 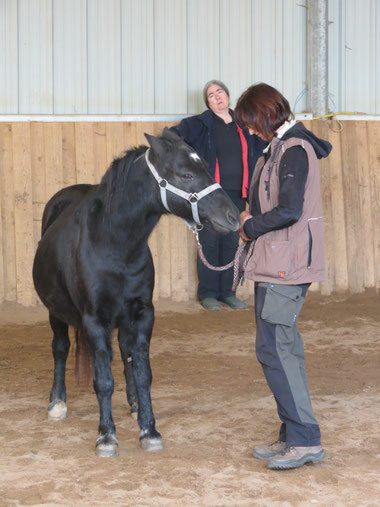 Micro-riding is used to train body awareness, regulation and steering of breathing. Never before had I had contact with it, and once again I was impressed with how very minute details have a great influence on our overall perception, our body balance and movement. You can find more information on Alexandra's page [or in this article]. In the course of the afternoon, a human-horse team trained one after the other and the progress as compared to the first day was clearly visible. In the coffee break, I cut carrots as preparation for Mogli’s and my training. Today, we would certainly also make good progress in our communication, and I wanted to test my new skills in practice. When our training session began, I asked Alexandra to practice again with her. I wanted to make sure I was able to retrieve the newly-learned body feeling just as well as on the previous evening, when we had finished our training. We walked together round the circle, but the feeling of ease was not there yet. Alexandra gave me feedback, we went another round, nothing yet, my movements were better than on the first practice day, but not as fluent as the night before. We went around and around, while Mogli waited impatiently for his session in front of the riding school. Nothing - my disappointment grew, I could no longer reproduce the feeling of easiness, that flow of the movements from the feet through the body into the hands. Finally, we decided that Mogli was going back in the paddock. So I did not want to practice with him, that was not the best thing I could give him as a training partner. He did not have to act as a "training object", if my human team partner could already tell me that my signals were still too tight and felt rough. What happened ? Why had I forgotten everything I had learned before? Alexandra and I tried different exercises, which had helped me the evening before to develop the right balance and flow . They did not help that evening. The breakthrough came when we started talking about other training aspects than the rope handling, while continuing to repeat the exercises over and over again. Once Alexandra led me, then we switched and I led her. The moment I stopped thinking about how to balance myself, my body began to synchronize with Alexandra's movements while walking. After all, my body had practiced the pattern of movement, I did not have to think about it any more. The subconsciousness guided my movements, the daily balancing exercises we did with Alexandra showed an effect, and I was able to balance with her, take turns and twists, keeping our common rhythm. Alexandra advised me to repeat the exercise directly with another training partner to develop a feeling that each new training partner has a phase of learning and synchronizing before the so-called "flow", the harmonious training. I knew this from training with the dogs, where it is easy for me to find the flow with a dog. To find it with a completely new task, in which new movements are needed, which are partly completely contrary to the automated movement patterns, which I learnt from dog training, was much more difficult. I wondered how do my clients feel during their training sessions with their dogs when asked to train complex movement patterns with a particular exercise? Like all seminars with Alexandra, the days passed much too quickly. The last training day had come and Alexandra suggested that Mogli and I start that day. Again I cut carrots, again I was optimistic to have a good training session with him. Before we took him out of the paddock, I asked a friend who also attended the seminar to be my training partner and to repeat the exercises with me. We stood in the arena opposite each other, and in my mind I went through the balance and breathing exercises that Alexandra had taught us in the past days, then we started the exercises on the circle. It felt easy and harmonious after a few steps, just as I had finished the evening before with my training partner. I was ready for communication and a game with Mogli. Our game would be: do you know the signal? Can you stop when I stop and signal "Grown ups"? Can you go when I give you the signal to go? We brought Mogli into the riding hall and our game began. From the beginning I felt safe with what I was doing. I gave the signal for "grown ups", waited and watched his reaction, clicked and fed him for the right response to my request. I gave the signal "Walk off casually" and watched his reaction, changed slightly my body language, or walked 1-2 steps with him before I stopped again and signaled "Growns ups". We developed a common communication, a common rhythm. My focus was on his reactions to the signals I gave him, I tried little changes, followed Alexandra's instructions, and could implement them directly. This is how training should feel. Of course, I had not mutated into a professional horse trainer overnight, and there were misunderstandings between Mogli and me. These were helpful information for me, which would be my next training steps, what I would have to practice with him and what he would have to learn if we continued to train together. All in all, we completed a successful training session that gave Alexandra and me valuable information about what our next training sessions would be. The exercises felt easy and playful most of the time, just as I imagine good training. I asked Mogli if he understood my signal and he answered me with his behavior. It was a harmonious communication between two dancers and I found the answers to my questions that had kept me so busy in the previous weeks. Thank you Alexandra for creating the safe envrionement for me and Mogli that we needed to develop a common game! What I learned about playing in these days? Playing requires rules and a safe environment within which the two partners move. The safety of the players has top priority. Safe play requires a common communication of the players as a basis. Playing requires reliability and deep trust between the players. Playing is lightness and joy, one can not force play with willpower. Game begins when it is adapted to the abilities of all players and ends when asking "too little" or "too much". It is the subtleties, the small details, which decide whether we play together or work. In the game there are no mistakes, only variations of the game. Playing requires an open mind and inner balance to adapt to the other player, to accept his communication and to develop together. Everyone can play when he is ready to get involved with his play partners and the necessary playing rules.